When you look into your eyes, you may be trying to steel yourself for an interview. Or maybe you’re just checking to see if they are red and bloodshot, irritated by allergies or perhaps a long night out. But when doctors look into your eyes, they can see a lot more. The eyes might be the proverbial window to the soul, but they are also a clear window to your health, and the amount of information they can reveal is astounding. Many conditions cause symptoms throughout the body — some show up in the skin, others in the mouth, and some even in fingernails — but the eye is one spot that reveals a particularly large percentage of health issues. With so much visible, more than 30 conditions show symptoms in the eyes. That’s why eye doctors — ophthalmologists — and optometrists are frequently among the first to spot certain problems. An eye exam can frequently be the first indicator of serious health conditions like diabetes, high cholesterol, or even a brain tumour, according to the insurance company VSP Vision Care. Here are irregularities that show up in your eyes — and sometimes mean that something more serious is at stake. 1. Red spots, caused by dots of blood in the eye, can be a sign of diabetes — a terrible disease that the CDC predicts 40% of Americans will develop in their lives. If blood sugar builds up too high, blood vessels begin to get blocked and to swell up. 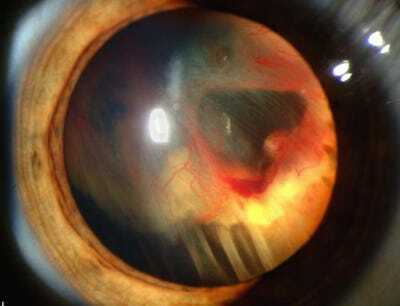 This can burst the tiny blood vessels in the retina, causing bleeding. If it’s not treated, this can potentially lead to impaired vision or even blindness. 2. But bloodshot eyes can be caused by many other conditions, too — ranging from an intense cough to pinkeye to a fungal infection. 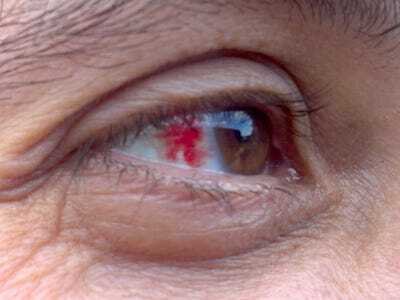 Conditions that cause bleeding in the eye range from benign, like that shown here, to the quite serious. 3. Itchy, swollen, red eyes are common giveaways that a patient is suffering from allergies, frequently triggered by pollen, dust, or pet dander. Eyedrops can help, especially if they include an antihistamine, though be careful of oral antihistamines, as some can cause eyes to dry out, worsening the problem. 4. Dry eyes are a side effect of both computer usage and many medications, like sleeping pills, pain relievers, or anti-anxiety medications. Autoimmune diseases can cause dry eyes as well, especially one called Sjögren’s syndrome, which destroys moisture-producing glands and mostly affects older women. 5. Most people lose the ability to focus on close-up things like the print on restaurant menus as they age, but certain medications — antidepressants, antihistamines, and diuretics — can cause this condition, called presbyopia, to happen prematurely. 6. Blurry vision can be caused by a long list of eye conditions, but for those already at risk of high blood pressure, it can be a sign that someone needs to get to the doctor immediately. Once a person’s sight is obscured by side effects of hypertension, that person needs treatment quickly, as vision and more is at stake. A torn retina can cause the retina to detach, like this one — though this was caused by an illness. 7.Suddenly seeing specks or flashes of light can be a sign of a torn retina. Some people experience these symptoms with migraines or simply as they grow older. But a sudden increase in the size and number of specks or flashes of light you see can be caused by a torn retina, which needs to be treated. That’s especially the case if the flashes or spots are accompanied by a shadow or loss of peripheral vision, which very likely indicates a detached retina. 8. Eye doctors can be the first ones to detect some cancers. An eye doctor can check for ocular melanoma, a rare form of melanoma but one that usually can’t be detected by looking in the mirror. If other causes of pressure or pain in the eye are ruled out, Wilkinson says, an eye doctor may check to see if a brain tumour is a possibility. 9. High cholesterol can frequently cause white rings to develop around the eyes, and can also cause yellowish bumps to appear in the eyelids. Older patients are likely to also develop similar white rings, but in any case, it can be a sign that cholesterol needs to be checked by a doctor. McGrann says the large number of diseases that cause symptoms in the eye should convince people that an annual eye exam is worthwhile. An annual exam is especially necessary for anyone over 40, Wilkinson says — though he notes that many of these health conditions are frequently detected first during routine medical screening. At that point, changes in the eye and body mean that eye doctors have important conditions to monitor, even if vision is stable. And new problems can surface at any time. 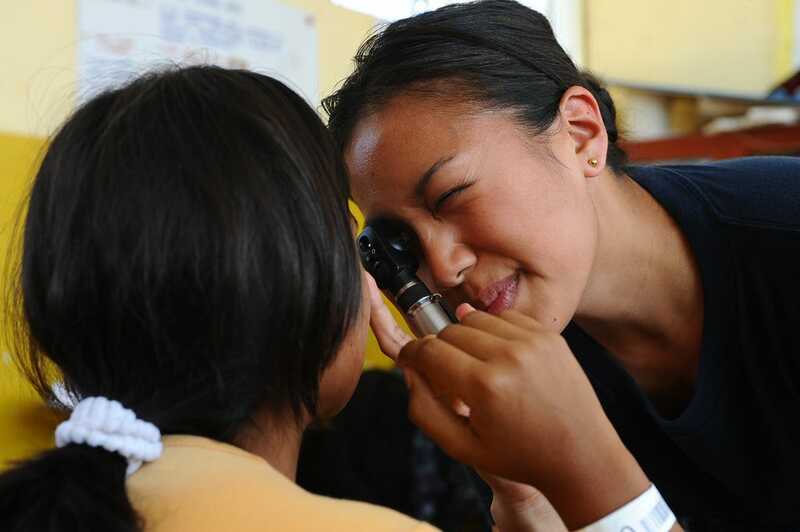 Many can be treated before they cause a problem — but only if a doctor has a chance to examine the eye in the first place.